Occasionally, those restoring old buildings stumble across the remains of unfortunate animals inadvertently trapped inside crawlspaces or crevices sealed by opposing walls and ceiling. At first, the unfamiliar might suspect that these hapless creatures had become suddenly confined within, and had expired of starvation and dehydration shortly thereafter. A natural ‘oven effect’ inside the wall might then have resulted, desiccating the corpse and turning it in to a mummy. As those familiar with Poe’s Cask of Amontillado know, there is sometimes much more to the story of such finds. In one of the most famous ‘animal mummy’ cases in the recent past, engineers undertaking restoration work last year at a reservoir near Pendle Hill in Lancashire, England, found what appeared to be the remains of a buried and long-forgotten 17th century house. They called archaeologists, who dug further into the grassy knoll and uncovered the entire building, it having collapsed on itself, and which included an internal wall in which a cat had been entombed. The dig site was in the same immediate area in which occurred the Pendle witch trials. 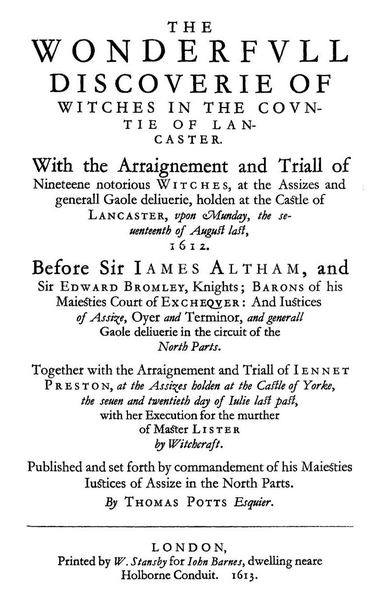 For those unfamiliar with the Pendle witches, twelve people – ten women and two men from the Demdike and Chattox families – were accused of causing the unexpected deaths of several neighbors, along with other nefarious roguery including sexual licentiousness with Lucifer, Beelzebub, Mephistopheles, and the usual cast of netherworld suspects. All of the defendants were swiftly convicted and sentenced to be hung, drawn, and quartered (though only eleven met that end, one dying conveniently in her cell the night prior, on 19 August 1612). 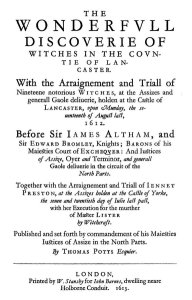 This represented one of the largest mass-executions of 17th century witches in UK history. In the hysteria that predictably resulted from the then-widely accepted belief that Lancashire witches were everywhere, it is likely that the unfortunate feline was intentionally immured in the structure by superstitious locals to ward off these endemic evil spirits. Period folklore held that the presence of a cat – alive or in spirit form – was effective in blocking curses and other undesired visitations upon a home and its occupants. And despite America’s own Puritan witch-hunt history, I cannot find any sources that point to similar finds in the United States. Thus, this sacrifice appears to be one of the few period witch-cats still extant. The Pendle Hill cat has gone to a nearby museum to live out her retirement in climate controlled comfort. But what I find a bit more disquieting is that if one Googles ‘mummified cat’ and ‘Etsy,’ there will appear a number of sale listings complete with photos. Not 17th century witch-cats (though that cannot be far behind.) Not Egyptian god-cats preserved like Tutankhamen. But real live (?) feral barn cats which expired when trapped between bales of hay and dried out in the not-distant past. No joke… look for yourself. Almost nothing of the macabre disturbs me, but that’s just plain gross! In my original post, The Pendle Hill Cat, above, I offered that, the Lancashire discovery notwithstanding, there are no examples of purposeful immurements of cats inside walls on this side of the Atlantic of which I knew. Sharp readers set me straight on this point, for which I send thanks. And I learned a great new Scrabble word in the process. Apparently there have been a number of such inurnments in the U.S. associated with both domestic and public structures. Relatively common finds include boots, clothing, hats, and gloves; glassware; toys; horseshoes; knives; and printed ephemera, especially Bibles. But mummified cats – and even one horse’s skull, in Massachusetts – have been found as well. Sometimes the dried cats are found in poses, such as leaping at small mummified mice and rats that are entombed along with them. Secondly, I spoke this week with staff at the Museum of the Middle Appalachians in Saltville, Virginia, about an exhibit that was curated several years ago entitled, ‘Concealed Objects.’ Saltville, a small village in the rural southwestern part of the state, was in the 19th century the site of the Holston Salt and Plaster Company, which was then purchased by the Anglo-Irish Mathieson Alkali Works in 1893. Mathieson turned Saltville into a company town, owning all of the buildings, running the general store, and paying the police force. It seems that Mathieson also supplied many of its own workers, most of whom were themselves from the British Isles and brought with them some of their folk ways. An old log home on the former DeBusk farm, in unincorporated Beaver Creek not far from the Mathieson site, was found recently to have a mummified cat entombed between the lathe and logs. Although this feline’s story is now lost, she was a centerpiece of the museum’s exhibit, though I’ve not been able to find photos yet. The cat has since been returned to the property owner, her fate unknown. I’m eating chicken noodle soup right now, and I just cannot bring myself to Google Etsy, the mummified cat. Having grown up with goregallery.com, I think of myself as generally phlegmatic, but I’m afraid I can’t stomach that right now. Maybe it’s just because I love cats? Thanks for the tip on goregallery.com, Lisa, but they apparently didn’t pay their URL fee, since it’s a dead link, pun intended.